Missy Graff Ballone: Please tell me about your background. When did your interest in yoga and wellness begin? Was it before or after you began making jewelry? How did Reset come to be? 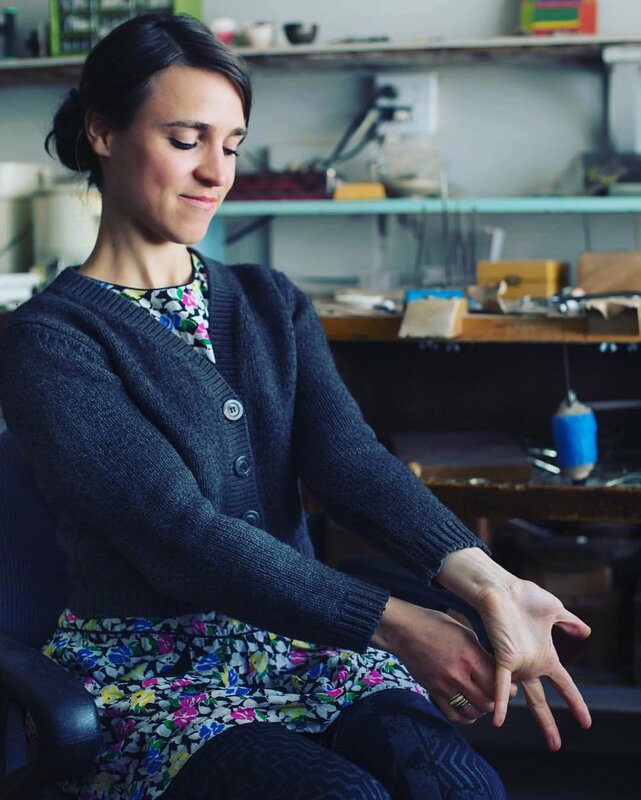 Raïssa Bump: Here is my Reset story: I’m a maker by trade and by nature, and love what I do. For years, I’ve spent hours each day at my worktable, making jewelry or knitwear. Over time, my body started to feel stress that was directly related to my work habits. My fingers locked up, and my jaw, upper back, and neck were extremely tight. I became aware of my posture and how much time I spent in stressful positions. Once I acknowledged this trend toward dysfunction, I had no choice but to make changes. Real solutions were needed that could be incorporated without much time or money. The alternative was potentially facing painful and expensive surgery and missing months of work. In 2008, I became certified in Forrest Yoga. Within that practice, I found stretches that were easy to incorporate into a daily routine that could be done while sitting at the workbench. I got curious and sought out additional stretches. At first, I focused on my personal issues and how stretches and small shifts could profoundly change my experience. It was wonderful to feel relief from my strains and aches and I noticed additional benefits from these new habits–increased focus, shifts in perspective, and a heightened connection to my creativity. It was amazing! It wasn’t long before I observed and heard about similar strains in other people. I had the epiphany that these techniques could benefit all types of people suffering from repetitive strains and stresses, and from there, the goal of Reset became clear. Can you please tell me about the mission of your organization, Reset? Raïssa Bump: However you choose to spend your day, whatever your occupation or hobby, your body and mind are your primary tools. Reset teaches quick and simple techniques to keep your body in working form, your mind attentive, and to help prevent or relieve common strains and stresses. These techniques help you to reset yourself and regain focus, shift your perspective and re-energize. At its core, Reset’s mission is to educate individuals and groups to be attentive to their bodies’ signals and to provide them with practical Self-Tuning techniques. The Self-Tuning techniques can be done quickly. They are simple stretches and exercises that can be performed during times of waiting, indecision, or in moments when one feels stuck. They can be done whenever and wherever, without requiring any special equipment or prior experience. Reset’s techniques are appropriate for people of all types and ages. I understand that you work with jewelers, teaching them preventative self-tuning techniques. Can you please tell me about this? Raïssa Bump: Reset’s Self-Tuning techniques are applicable to many different kinds of people: musicians, gardeners, office workers, etc. The focus is not solely on jewelers. However, being a jeweler myself, this group of people is near and dear to my heart. I understand the ins and outs of the practice and how it takes a toll on our bodies. When I go to a jewelry classroom or studio for a workshop, the focus is primarily on teaching stretches that one can use both for relief and preventative reasons. I want to provide others with helpful tools (stretches) that are simple and don’t take much time (a couple of minutes for any given one). These stretches can easily be done in a jewelry studio setting. Within the workshop, there is also time to discuss other topics, such as tips related to studio set-up/ergonomics and how habits are formed or broken. What are some of the most common body mechanic issues that jewelers have? What can they do to prevent these issues? Raïssa Bump: We jut our heads forward. We cross our legs for hours as we work. We perform the same repetitive actions over and over again without pause. We hold our saw frames with a death grip. We strain our eyes by focusing at short distances for extended periods of time. We extend our pointer finger when we file or hammer. We clench our jaw when we are focusing on something. We hunch our shoulders forward as we work. We do not sit or stand at the proper height, in relation to our workbenches, when hammering, sawing, filing, etc. All of these acts combine to create a cranky body. Becoming aware of these actions/habits helps to make them happen less often. Perhaps this noticing/mindfulness happens once a month, then once a week, then daily and eventually multiple times a day until suddenly you are no longer doing that act. Rubbing a tight spot, taking a few moments to do a stretch… these small acts go a long way. How does your personal yoga practice tie into your daily studio routine? Raïssa Bump: I love longer, on-the-mat, yoga practices. These happen throughout the week, but not necessarily daily. They fuel my creative energy, bring me mental clarity, and provide me with quiet time to connect, have fun and challenge myself, as well as stretch out some deeper kinks or tight spots. Every day, while in the studio (or on the bus, or waiting in the grocery line…), you will find me pausing to take in some deep breaths, stretch and reset. These are the same stretches that you will learn in a Reset workshop. They are easy to do while standing or sitting in a studio chair. Their benefits are palpable and keep me physically able to make my work. Can you please tell me about the Cat’s Paw self-care tool? Why is this a tool that makers should invest in? Raïssa Bump: Our hands work in one direction—towards closing – and the balance in our hands, wrists and forearms therefore goes out-of-whack. I have found that with jewelers this imbalance can be extreme. Cat’s Paws restore a natural biomechanical balance to our hands, wrists, and forearms, which may have been lost due to constantly straining our muscles. Cat’s Paws exercise and strengthen the opening muscles of our hands and arms and therefore work to relieve or prevent repetitive strain injuries, overworked hands, and carpal tunnel. I first used a Cat’s Paw in my Forrest Yoga Teacher Training in 2008 and have continued to use it since. I believe the tool has been around since the 80’s. You can go to www.catspaw.com to read more about it. It is a great tool to have on the studio bench or in a purse. From your experience, what area of the body do you think makers neglect most in their studio practices? Raïssa Bump: Hands and eyes. Do you feel that your process of making and your wellness practice overlap in anyway? Raïssa Bump: These two practices are intertwined. They directly affect each other. They are part of a whole. My making/creative practice is more inspired and focused when I am taking time to connect with my spirit and feel better in my body. On your website you have step by step instructions for your self-tuning techniques. How do your workshops differ? Raïssa Bump: Learning happens in many ways and is often categorized in three styles—visual, auditory and kinesthetic. It is true that you can download an e-book (and soon audio files!) of our Foundation Stretches from the Reset website. These work well for individuals who learn in those ways. However, they are even stronger resources when used as reinforcement after having learned the stretches in person. Workshops provide a dynamic combination of all three styles of learning. Each reinforces the others and allows for a learning experience that is more memorable (right down to the cellular level). There is also time for questions and answers, time to talk about basic studio ergonomics, how habits are formed, and variations of stretches that are not included in the Foundation booklet or audio tracks. If you commit to multiple sessions, the learning process is even more profound and new techniques and habits are more likely to stick. Do you have any advice for artists who are experiencing pain in their bodies while working in the studio? Raïssa Bump: Frequently switch-up the actions you are preforming. Assess what action is making the pain occur. Could you do that action differently? Learn some stretches. Stretch even if you don’t feel pain. Stop working if the pain persists.